A low calorie snack or side packed with flavor. 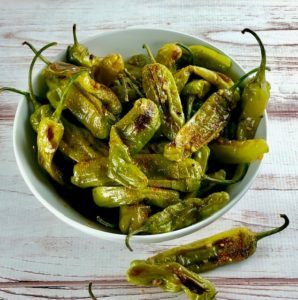 Shishito peppers are bright green, about the size of a finger and normally have a mild flavor. About one in 10 have some heat. I love this recipe and normally make a double batch to have around the house for a snack. Trader Joe’s usually has shishito peppers in stock in the produce section. Togarashi is a mixture of ground chili peppers and other seasonings and is available at Asian markets or on line. It has a nice flavor kick and is also great sprinkled on rice, sauteed spinach and meats. This is a great recipe to make for a low calorie snack or light vegetable side dish. Find the peppers at Trader Joe's. Togarashi is available in Asian markets or online. 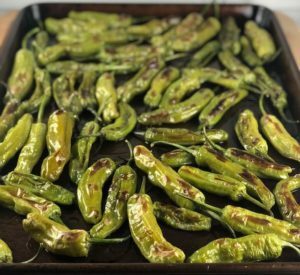 Place the shishito peppers on a rimmed baking sheet. Drizzle olive oil over the peppers and toss until the peppers are evenly coated with the oil. Scatter the peppers on the baking sheet in a single layer. Place baking sheet in the oven and roast for about 5-7 minutes until the peppers are lightly charred in places and blistered, stirring once or twice. Combine soy sauce, lime juice, ginger and garlic in a medium bowl. Toss the roasted peppers in the citrus soy marinade. Sprinkle with togarashi.